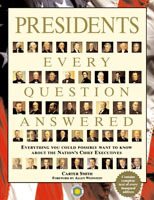 A one-of-a-kind sourcebook of information on the Presidents and Presidency. The 2004 presidential election was an event of great interest, as you may have noticed. More and more, people all over the planet are paying attention to the office of “the most powerful man in the free world.” So we’ve made a book that will be the ultimate source book for answers to just about any question that you could ask about any president, past or present (to which you could reasonably expect an answer). We came up with a design that allows you find the information you need quickly and easily, and is also pleasing to the eye-no mean feat. We have a book that will tell you each president’s date of birth and death, place of education, religion, party, term in office, vice-president, cabinet, first lady, career-before and after office-and much more. There is a timeline of the presidency and of world events. There is an electoral map for each campaign, plus a list of opponents. There are quotes by the president, and about the president, both then and now; there are lists of bills passed; there are the successes, failures and indiscretions. There are rankings; there’s information on supporters and on enemies; quotes from famous or infamous speeches-really, anything you can think of. And if that isn’t enough we’ve included the complete text of every inaugural address. This book will become an invaluable resource for historians, students, history buffs, journalists, and as a family reference. With an introduction by Allen Weinstein, founder of the Center for Democracy, it carries the Smithsonian’s seal of approval. Allen Weinstein is the founder of the Center for Democracy. His international awards include the United Nations Peace Medal (1986) for “efforts to promote peace, dialogue and free elections in several critical parts of the world”; The Council of Europe’s Silver Medal (twice, in 1990 and 1996), presented by its Parliamentary Assembly, for “outstanding assistance and guidance over many years”. Professor Weinstein’s books include The Haunted Wood: Soviet Espionage in America-The Stalin Era (Random House, 1999); Perjury: The Hiss-Chambers Case (Knopf, 1997), which received several citations including an American Book Award nomination; and The Story of America (DK, 2002).